Click for the most recent OSR iRacing setup news. Click to join the OSR League. Lanier National Speedway is now known as Lanier Raceplex. Naples, ME — After lying dormant for almost ten years, officials from PASS — the Pro All Stars Series — and the track now known as Lanier Raceplex announced late on Monday, April 15, that asphalt stock car racing will return to Braselton, Georgia later this year. The PASS Super Late Models will headline the PASS National Championship season finale on November 15-16 at the track formerly known as Lanier National Speedway. Details regarding the race, along with support divisions, will be announced in the coming days. A practice day for all divisions competing is scheduled for Friday, November 15, while additional practice, qualifying, and all features will take place on Saturday, November 16. Sunday, November 17 will be reserved as a rain date if needed. This is something we have been working on for a very long time. We plan to announce more details soon but wanted to let drivers and fans know as soon as possible that stock car racing will be returning to Lanier in 2019 so they can make their plans to join us. PASS is now entering its twelfth season and is Asphalt Super Late Model racing’s only true national championship. The promotion will bring drivers together from all over North America to compete this Fall at Lanier Raceplex. In addition to the grandstands being open, Lanier’s famed trackside parking will be available to the fans for this event. The track was repaved and all infield buildings were torn down at Lanier Raceplex as the facility was transformed to host drifting events and Go-Kart racing for the public. All race cars will be pitted outside the track so fans will be able to enjoy an unobstructed view of the action from any vantage point at the speedway. When PASS began sanctioning Super Late Model races in the south, Lanier National Speedway was one of the first tracks to come on board to host an event. Georgia native Jason Hogan won the first PASS race there in 2006, while Maine’s Corey Williams took the checkered flag the final time PASS held a race at Lanier in 2007. The 2019 PASS National Championship Super Late Model season continues this weekend at Hickory Motor Speedway with the 14th Annual MyComputerCareer Easter Bunny 150. An impressive list of drivers from across the country is entered including Preston Peltier, Bubba Pollard, Matt Craig, Ben Rowe, Travis Benjamin, and many more. 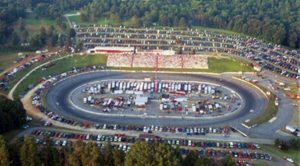 Also, PASS is continuing to look for a makeup date in the Fall for the postponed National event that was scheduled at Dillon Motor Speedway in February. The Pro All Stars Series is recognized as North America’s premier sanctioning body for asphalt Super Late Models and boasts such marquee events as the legendary Oxford 250 at Oxford Plains Speedway, PASS South’s Easter Bunny 150 at the historic Hickory Motor Speedway, and the PASS Commonwealth Classic at Richmond Raceway. For technical information concerning all PASS divisions please send questions to passracing@roadrunner.com. For media or marketing questions, please contact Alan Dietz at 704-231-2039 or alandietzpass@live.com. And, don’t forget to “Like” the Pro All Stars Series on Facebook.